I often find myself tempted by all the beautiful cookies around (especially during the holiday season). Sugar cookies, gingerbread cookies, and cookies with frosted tops…they all look so good! Luckily, there are some healthier low calorie cookie alternatives (and you don't have to bake them yourself although that can be fun too sometimes). These ultra-soft cookies are very close to what can get to home baked taste without actually baking them yourself. At just 130 calories, 3 weight watchers points plus points, and no trans-fats or cholesterol, they make a great quick pick-me-up snack or even an on-the-go breakfast. I love the ingredients that Bare Naked uses - including the whole wheat flour, whole grain oats, and cane juice. The fruit and nut variety have bits of walnuts, raisins, almonds, and coconut that give them a chewy yet soft texture. And if you love chocolate, and who doesn’t, the double chocolate is aptly named for sure, and also has bits of chocolate chips, almonds, and walnuts. Yum! I would love to see Bear Naked come out with a chocolate chip variety too! I like to eat these on their own, with a glass of almond milk, or even crumbled in some low fat creamy fage yogurt! 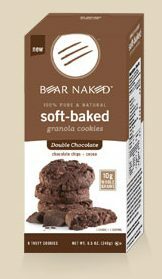 I love Bear Naked granola..I never knew they made cookies. Happy New Year!